iPad Mini 5th Anniversary Giveaway! Fine Print: I am sponsoring this giveaway! All opinions and statements below are my own. Two weeks ago marked the 5th anniversary of Couponing For 4 and I thought that we should celebrate! I love finding the deals for you guys every day and I thank you for reading, being supportive and hanging out with me. I racked my brain for a good gift to give for this exciting occasion and I think I came up with a good one! 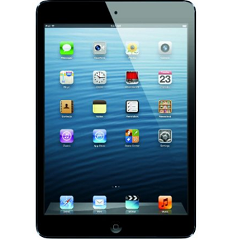 One very lucky Couponing For 4 reader will win an iPad Mini!! No strings attached, just my gift to you. THANK YOU for readership and support! To enter this giveaway, complete any or all of the options listed below. Giveaway ends 9/2. Good luck! I hope to win this. I never win either…but what the hey! Thanks for always posting such terrific deals!! Thank you all for letting me win. Ooooooohhhhhhhh I would soooooooooo love an IPAD MINI!!! I’d love to win the iPad to help with the new school year! Happy Anniversary! I would love to win an Ipad! Got one for my son and now I want one! Thanks for all you do and finding awesome deals! My son wants this so bad for Xmas. He has been asking all year long! Congrats on your anniversary. Thanks for all you do! Happy Anniversary! ! I’d love the ipad for my twins. They keep trying to steal my phone! Congratulations and thanks for celebrating with such an amazing giveaway! Would absolutely love to win this for my daughter who is heading to college! Thanks for all you do for all of us! Thank you for the giveaway! My kids always steal mine! This would be great in our busy household. Thanks for the chance! I would love to win an Ipad. Thank you for all you do. Congrats on 5 great years. My family could really use a new iPad mini!! Thx for all u do!! What a great idea to share your amazing info! Many congratulations on this anniversary. We will celebrate five years of chambanamoms in November! How awesome…congrats on five years!!! Happy, Happy, Happy! Thanks for the Giveaway! Congrats on your blog anniversary – would love to win! Thanks for the great blog and giveaway!!! Great site. Hope I win. Wow! You’re being so generous! 🙂 Thanks so much! Would be great for our homeschool classroom! What an awesome giveaway! Happy 5 years! Thanks for the giveaway!! Hope I’m the lucky wiener!! Thanks for doing a nice Giveaway! Congratulations on your Anniversary! Great birthday gift to me! I love reading your website….definitely has helped me in my couponing journey!! Thanks for opportunity! So wonderful of you! Congrats and thank you for your wonderful work!! Hope I win. Have not won anything in a long time. I would love to add this to our Apple family of iPhones! This would make a great gift for my kids got Christmas. How I WIN! Congrats on your 5th anniversary… I love your blog! Thank you for your generosity! Good luck to everyone! Great contest! Congrats on 5 years! I would love to win!! Thanks for the couponing help. Happy anniversary!! Thank you so much for all the great advice you give us. I want to win really bad. Would love to win! Thanks for the contest. Oh how I would love to have this! Love your blog, always sharing with others, happy anniversary! I need this for so much money saving and planning and reading!!!!!!! I would love to win this. I appreciate all that you do. AWSOME site! You guys have such a great heart for helping people in need save money. I would love to win this iPad because my daughter just started back to school and they want her to have an apple device for photo class. And right now we don’t have the money to get one. She really wants to be a photographer and if I can’t get her one she has to drop this class. She is in the 10th grade and is worried that her dream won’t come true. Thanks again for all you do. God bless! I would use it for my husband that has a TBI from IRAQ. Great for memory. I’ve only been couponing for 2 years, but it’s been great following you! Mama needs a new ipad. Happy Anniversary! Thanks for all your hard work!! I would love to win this! Thanks for the great giveaway. Thanks for all the couponing help on your website!!!!!! This would get a lot of use in my household! We don’t yet have an iPad! Happy anniversary. It would be nice if I was the winner. Happy Anniversary & thanks!! Everyone in our home would enjoy the iPad mini. This is a great giveaway. Thank you! I never win anything. It would be a cool present for my dad’s birthday in September! Would be wonderful to win. Happy Anniversary !!! Amazing prize! Love all the work you put into finding deals for us! I check everyday for your posts! Thanks! Would love this for my preschool classroom! Our computers are old and moody! Love Coupon ing for 4! Would luv to win for my college student he needs one! Happy Anniversary! Thanks for all of your hard work! You have saved my family a ton of money. Would make following you easier with an iPad. This would be awesome if I won! What a great giveaway! Your tips have helped me save money-making it easier to coupon, thank you! Congrats on your 5th anniversary of Couponing For 4! Happy to be a follower! Thanks so much for all you contribute! I would love to win this to use for school! Thank you for your blog and the opportunity to win! I would put this in my Christmas donations for needy kids!!!!!! I am so glad you have reached your 4th anniversary. What would we do without you? I have saved and practiced your shops every week! Wow 5 Years Congratulations. You have helped save my family lots of money the last few years!! I really appreciate your facebook posts and all the work you do to collect deal ideas. I read your email everyday to see what I can save on. Thanks for all you do! This would be an awesome prize. Happy 5 years! Happy Anniversary! Thanks for a chance to win such an awesome prize!! Thank you! Would love to win. happy anniversary thanks for the chance to win such a wonderful gift!!! Happy anniversary! Thanks for hosting this giveaway. Happy anniversary! Thanks for the giveaway :-). Love your site – have saved so much money! Keep up the great work! Wonderful prize for anyone who wins! This would be a nice replacement for my old ipod touch, there are so many new apps I can’t run on it and it’d be nice to have a device with a camera. I’m lucky to have the devices I do, but I seem to get them a year too early because each time I get one the next one comes out with a camera! Love your site and the great deals you post! I’ve shared with all my friend. Love your website 🙂 Great giveaway! My son just started Medical School and really needs one. Thank you for a chance to win. My family would enjoy this ipad. Thank you. Would be great to win this! Thanks for all the great deals. Would love to win this! !! Thank you for another amazingly generous giveaway! This would be great for travel! Keeping my fingers crossed…thanks! Thank you so much for offering this and for the great deals you post weekly! Oooohhh yes as. That would be so awesome to win !!! Happy 5th Anniversary! Thank you for your hard work! Happy Anniversary. I love your blog and love the deals. One of my fave blogs!!! Happy anniversary! Love your blog! congrats on your anniversary,thanks for the chance. Congrats on your 5th anniversary! Thank you for the giveway! Congrats on your anniversary. Thank you for the great opportunity. It would really help out with school. Thank you for the opportunity. Would love to win this. Id be on Pinterest coming up with my next great idea ALL the time if I won this! Happy Anniversary!! Yayyy! Congrats 🙂 And you are so nice to have this awesome giveaway too! I just moved to Chicago and found your blog. Love it and thank you for doing it! Congrats and here’s to another 5 years! congratulations and thank you for a great giveaway. Thanks so much Alli! Happy 5-year!! So glad to have been following for most of that time!! I would love to win this. Great Giveaway. Thanks for the Chance. Cheers for many more years of success. Thanks for the opportunity. Thanks for all you do!!!!!!! great giveaway! hope I win it! Awesome giveaway. I love the deals and the mini would be great to win. I am following on Google (don’t know how to use it, never did but I am under a different name …roberta wade…anyways I am following. Had to buy my son a new IPAD yesterday cause he dropped his the day before and broke it and he goes back to college today and needed it. The thing about it, is that I WAS SUPPOSED TO GET THE NEXT IPAD. Now the only way I get one is if I win one. so needless to say I am entering all the IPAD contests I can find. I LOVE your prizes. you have great prizes all the time, Haven’t had any luck yet (got real close once but unfortunately we weren’t playing horseshoes!) ANYWAY…Happy Anniversary! THANK YOU FOR ALL YOU DO FOR ALL OF US EVERY DAY ! ! ! Fingers, toes and eyes crossed!!! Thanks for the chance. Happy, happy anniversary! Thanks so much for your generous giveaway! CONGRATULATIONS! You should be very proud, it’s a great site. Would LOVE this! Fabulous giveaway! So excited for you to reach your 5 year anniversary! So exciting! Love your website. Thanks again! Fingers sooo crossed!! Thank U for the super giveaway!! Woohoo!! Thanks for having this contest! We all appreciate the deals you show us and it feels great to know you appreciate US (your fans)! A family member of mine would *love* to have this!! Thank you in advance if I win. I have been couponing for a lot longer than 4 years- closer to 40 and would love an i-pad mini. I would love an iPad mini. I would love to win this so that I could give it to my grandson for his school work. Thanks for this awesome chance. Happy 5th Anniversary! Thank you for all the great deals you bring us each day and for all the wonderful giveaways! Thanks for all you do! Love your blog! What a fantastic giveaway! Love your blog and appreciate all you do for your readers! Thanks for the great giveaway! Good luck everyone. Very generous, thank you for the.chance. never won an I Pad . Would be so thrilled! This would make a great back to school gift for my niece who is in her first year of college! This is terrific, I would really like to give this to my daughter! This is an amazing prize! Thanks for the chance to win! thank you for the chance.. would so love to win for my grandson to use in school.. they ask them all to have one and he doesnt.. congrats on the anniersary! Congrats- Happy Anniversary!! I wish you many more successful years! Thanks for the awesome giveaway! Would love to have one of these to use in my classroom! i really love this giveaway and i’m totally crossing my fingers! Wow, that was a long way down! What a great prize! Happy Anniversary! So excited about the possibility….what a great Santa gift!! Love your emails with great deals. What a great giveaway. I have wanted an iPad forever. ipad mini – yes, please! happy anniversary!! Thank you for all of the posts that save me money! Congrats on your 5th and thanks for the very generous giveaway. Happy Anniversary! I’d so love to win an iPad mini – would be so neat to take on vacation this fall! Thank you so much for the opportunity to win! Happy Anniversary! Thank for the amazing giveaway! Hope you have many more amazing years. I hope I can win an ipad mini! Thank you for ALL your great deals!! Happy Anniversary Ali, thank you for all you do, cheers to 5 more years! Happy 5th Anniversary on your blog! I’m so happy to be a follower. Thanks for the awesome giveaway!! Congrats on your anniversary. !!! I have been attending in lot of Giveaways, but I never win anything, I hope I’ll win this time and it will be my best birthday present! Hello, hope you have a great day! Happy Anniversary! Thank you for this awesome giveaway. Thank you for the generous giveaway. An iPad mini would be so awesome and replace my dinosaur home PC that is about 8 years old and moves at a snail pace. I could use one of these for school! Thanks for the giveaway, Happy Labor Day weekend! This would be awesome for my daughter at college! Happy 5th Anniversary and wishing you many, many more. Thank you so much for such a generous giveaway. An iPad Mini would be amazing. I work in a small museum and we neet iPads for education programs. I would love to win an Apple iPad Mini for my daughter. She would be overjoyed to receive such a useful gift. I would love to win an I Pad mini!! It would help me with school. It sure would be great to win! Congratulations on 5 wonderful years! I hope you enjoy much success. happy anniversary! thanks so much for the chance to win. you rock. such a nice giveaway…happy blog anniversary! Congratulations on your 5 year anniversary. Happy Anniversary! Thanks for the great giveaway! Congratulations on 5 years. Would Love to win! Happy anniversary! I’d love to win this for my sister. Her computer broke recently and this would help fill the gap until she gets a new one! What a great giveaway my husband would love this! This would make those late night nursing sessions sooo much easier! Fingers crossed and congrats on 5 years!!!! This is a great prize! Happy blog anniversary! Happy Anniversary!! Thank you for the chance to win! I have a Google Nexus the size of the iPad mini, I’d love to try the iPad. I’d love to win this for my sister, who’s going back to school this fall and would be thrilled with the gift of technology. Plus, it would help her keep in touch when she’s away from home! Yay. Would be so thrilled if we won. Just think the odds are better than playing the lottery;) Thank you for the opportunity. Thank you for the chance and congrats! I’ve been wanting on of these for ages, so this would be a great thing to win. Thanks for the chance. I would love to win the iPad. Thanks for all giving me the chance to win! Thank you so much for such a great site! I have always been a bargain hunter, but never thought to transfer all of my energy over into couponing for household products and groceries. Your blog and facebook page has been a godsend and has made this whole process more attainable and less overwhelming. Thank you again!! I have such bad luck winning these. I’d love to win this! Congrats on 5 years ! I’d love to win this. Thanks for the chance! HAPPY 5TH ANNIVERSARY!! Thanks so much for the giveaway! Happy 5th Anniversary and thanks for having this wonderful contest! Congrats on your 5 year anniversary and thank you for the awesome giveaway. Happy 5th Anniversary! This is very kind of you to offer this nice prize. Thank you ! Thanks for the giveaway…and thanks for blogging ! Thanks for the great giveaway. Very generous of you. If I win this I would sing “Oh Happy Day”!